How you ever been able to not fall asleep? Which is worse being unable to fall asleep, or awakening in the middle of the night and being unable to return to sleep? We know the tale of just counting sheep jumping over a fence, but how many sheep have you ever seen jumping a fence? My wife was discussing with a coworker her inability to return to sleep, and the coworker said that a relative who is a doctor suggested that when you get up in the middle of the night to visit the pee-pee room, first, don’t look at the clock. If you can’t return to sleep, do the following: select a broad topic (movie titles, car models, authors, trees, wine brands, baseball players, or whatever) and then go through the alphabet selecting a word for each letter that has to do with a selected topic. As one who enjoys problem-solving exercises, the first time I tried this I stayed awake because I was obsessed with completing the task! Because of my experience, not only here’s the topic that I use, but a list to jump-start your mind for whenever you need. Heck, I now start with naming 3 per letter. By the way, this is NOT meant to be a comprehensive list of U.S. produce, let alone the world. This entry was posted in Miscellaneous and tagged Awake, Can't sleep, Falling asleep, Grocery Produce, Insomnia, Sleep, Sleep help, Wide awake. Bookmark the permalink. You might like the one I use, Frank — I do an alphabetical list of baseball players! Sometimes I do last names, sometimes first names, sometimes I do it by AL, or by NL. The problem is that when I can’t think of a player with a certain letter, I stay awake trying to think of one. I wish Ugueth Urbina was still playing, he was great for the letter U, obviously. You can also do retired players, thus can include Zolio Versailes. I’ve also used former Reds players. Thanks for stopping by. I never have problems falling asleep, but my problem, like you described, is not being able to get back to sleep once I wake up. So frustrating. But also like you, I think if I tried that suggested alphabet technique, I’d be more wide awake than ever. The first time didn’t work very well, but it’s much more successful than not. An important tip is selecting a comfortable topic. Thanks for visiting. when i can’t sleep, i think of a golf course that i know very well. then i imagine myself on the first tee, playing each shot as i have many times. i usually choose a course that i used to have a membership. at. for. anyway, i imagine myself walking the course as i’m playing. whenever i’ve done that, i have never finished the second hole before i was asleep. too bad though, it’s a nice course. Brilliant … as a golfer, I will have to try this! Many thanks for sharing!!! glad to share. and glad that soledad doesn’t have some kind of chandelier around her neck like most days. she has trouble picking out jewelry sometimes. That would probably just make me hungry Frank. I just accept the fact that I don’t sleep very much; 4-6 hours. I’ve gotten used to either getting on the treadmill in the basement or working the blog machine. I understand we elders don’t need a lot of sleep anyway. (easier than Seattle John) … No kidding about about happens to sleep patterns as we get older … thus a role for Benadryl … well, the Cosco variety beside it is super cheap. And yes …. and if I can’t sleep, why not work the blogs! Thanks for stopping by. Definitely … after the purchase, notice Benadryl’s price elsewhere! Good addition and that is something that I also do! Thanks for sharing. Hence the option that the topic is open to your choice … such as gardening plants. 😉 Thanks for commenting. Wow, you did it! I’m with you…if I had this task, it would do nothing but keep me up. But well done! I usually turn to a book, but sometimes that keeps me up, too. Welcome first-time commenter. Ha ha … staying awake to solve the problem sure isn’t fun – thus why I stick with the produce department. I do this now with a twist, by naming more than one. On the other hand, I consider turning to a boring book! Then again, sometimes I just concede defeat and get up! Thanks for stopping by and I hope you return. Frank, I guess this is a reason to keep boring books around! I usually don’t read those, and then you see, I can’t put my book down….Of course, I will return! Now there’s the perfect use for boring books. After all, that’s something almost everyone has around. Thanks for commenting. Thanks Frank, you’ve done my shopping list for the week. Ha ha … by shopping this list, one would discover other things not on the list. 😉 … Thanks for commenting. My surefire method of getting to sleep is to think about the roster moves the Cincinnati Reds should make before Opening Day. And that works? … after all, you have a tendency to over-think that topic. On a related not, naming Reds and former Reds is a topic to consider. Thanks for commenting. Oddly enough I woke up this morning and misread the title. Thought sure it said “back to sheep.” I guess I need to wake up completely before I start reading these posts. *sound of me knocking over something reaching for my first cup of coffee.*. Pleasant dreams. Oh my …. simply thanks for the chuckles and hope your coffee went well. Thanks for stopping by. I simply don’t sleep for long periods. My longest is 4.5 hours. If I wake, I pick up my book and read. If that doesn’t work, I just get up. Generally, I’m a light sleeper, so I can relate .. and I have gotten up on more than one occasion! Thanks for commenting. It’s awful to wake up in the middle of the night, but if it’s before 3-30, I can usually get back to sleep. 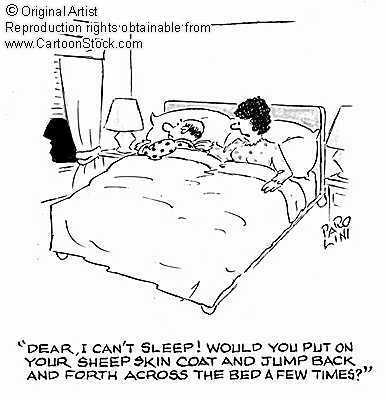 I’ve also tried counting sheep, but their Baa-ing, only served to keep me awake for longer. 😀 Your alphabetical list is impressive. I looked up this list and it’s not memorized … so I try to go do the best I can. Heck, I’ll have to return to this post myself to refresh my memory! Thanks for commenting. I desperately want less sleep. I want to be able to function on about 5 hours of it. I have a lot to do and sleeping is cutting into that stuff. Wow … I’m speechless. Then again, it depends what is one your list. Thanks for stopping by. That method would keep me awake as well, I usually put something on the TV put a pillow over my face and back to sleep. I appreciate your point, but I think I would suffocate. 😉 Thanks for commenting. Strange that people seem obsessed with the fact that they need ‘x’ amount of hours sleep every night and they must do something to make themselves go to sleep even when their body says it’s time to be awake. Everybody is different and probably every night is different depending on hard you’ve worked, how active you have been, etc., that day. I know people who think they need 10-12 hours, personally I’m more of a 4-6 hours guy. And late night/early morning is a great time to blog, less distractions! No obsession at this end, but I don’t like waking up in at 2:00 am, and then getting up at 3:00 because my mind is racing like there is no tomorrow for whatever reason. Meanwhile, 6-8 is fine for me …. actually I seldom get 8. Interesting how everyone’s clock is different. Because I don’t want you to lose sleep over the U or X … I’m officially adding one to the list … Ugly Fruit. Although I could have also added udo or urugula, but those aren’t common in my stores …. nor are xigua, xylocarp, and ximenia. Thanks for sharing. I have the exact opposite problem… I have to devise ways to stay awake! I have been known on many occasions to nod off mid-sentence on particularly sleep deprived weeks. It might sound nice, but it does get problematic to be essentially fighting off drifting to sleep half of the day. I have deep sympathy for those who can’t get to sleep (my husband is one of them) but can not understand them. Good luck on your list making! In other words, the kids are wearing you out! I couldn’t resist. Meanwhile, make sure you pass this idea on to your husband. Thanks for commenting and I hope all is well. Oh no … you fell asleep here! Thanks for stopping by to nap. You got to remember that I’m the grocery shopper here. Then again, the topic could be anything as Star Trek characters, WW II military generals, famous battles, whatever. Meanwhile, kudos for the method that works for you, thus thanks for sharing! Very well said … even last night I think I got up before midnight, although the actually thought is that I had been sleeping much longer. Thanks for commenting. Recently, I discovered a simple way to calm my mind and fall asleep or return to sleep. I concentrate on my breathing and simply think ‘inhale, exhale.’ After a few breaths, I’m drifting off to dreamland. On of the best things about this post is getting other back-to-sleep techniques. Thanks for visiting and sharing. Answering that question is outside my pay grade. Thanks for sharing the wonderful thought! I haven’t heard that remedy, but hey – what’s not worth a try when one is unnecessarily awake. Just pick a topic … the simpler the better … and go with it. Thanks for visiting. I try and resolve complex fractions – you know, something like 327 divided by 48. I can’t do this kind of stuff when I’m wide awake, let alone when I am lying in bed, and it gets me off to sleep a treat! Well, well, well … now complex fractions is definitely a unique approach. Gotta love it! Thanks for the enlightenment. I write blog posts in my head. The more brilliant they are in the middle of the night, the worse they usually are in the light of day. Yikes! I have to ask this question … if you write posts in your head to return to sleep, how does the post end if it puts you back to sleep? Sorry, I couldn’t resist … thanks for visiting. Is ugly fruit available in Australia? Regarding X, I could list Xigua, Xylocarp, and Ximenia – but they aren’t available where I shop. Then again, someone somewhere can get them! Thanks for commenting. First and foremost the “U” category does not count. No points for that. I try different tricks as well, and sometimes gradual relaxation technique. Most of the time nothing works because my mind is racing. All in all, one sleeps less when one (could be anyone) gets older. This doesn’t work for me when the mind is racing because I can’t concentrate on the list! … so I usually get em! Meanwhile, why doesn’t U count? After all, that’s the way I’ve seen it in the store! 😉 … thanks for sharing your thoughts.